Whether your goal is to save money on your energy bills or you want to preserve the life of your heating and cooling systems, it’s never a bad idea to consider what role your thermostat is playing. Your thermostat is a powerful tool, so it’s important to make use of it to save as much money as possible on heating and cooling. Although most people simply press the “up” button on their thermostat when they feel cold and call it good, it’s not quite that simple in the grand scheme of things. If you have any questions about anything in this blog, be sure to speak with our heating contractors in Flemington. Although you can keep pressing “up” on your thermostat whenever you’re cold, this is not usually the most energy-efficient way to run the heating system within your home. Programmable thermostats are one great way to cut back on costs by managing your heating system for you. This type of thermostat can be programmed to turn off or on depending on whether you’re home or not and keep your home at the desired temperature without you having to touch anything. Some of these thermostats even have built-in Wi-Fi capabilities so that you can manage your heating system while you’re away or on vacation. One temptation many people have when it comes to heating their home is to turn their thermostat up five notches or more the minute they feel cold. Although this may seem like a good idea at the time, it’s only a matter of time before you start overheating and need to turn it down. Instead, start by turning it up a notch or two. You may be surprised at how far that goes, especially if you’re in a small room. If your heating or cooling system isn’t turning on when you alter the thermostat, it may not be working. 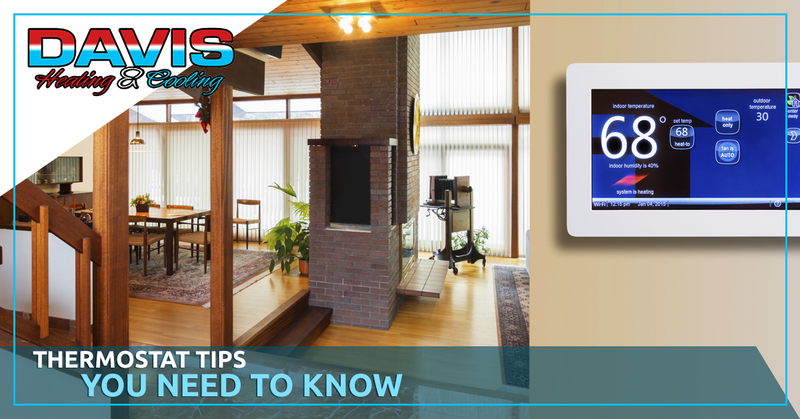 Unlike many people think, the thermostat isn’t part of the heating system, it communicates with it, and if something has gone wrong with the wiring in the wall or the thermostat itself has gone bad, it won’t communicate with your heating and cooling systems correctly. Take the time to speak with an HVAC specialist about what issue you’re facing and they may recommend changing it out for a new one. When you’re experiencing issues with your heating system or you’re having trouble operating your thermostat, your best course of action is to contact the experts at Davis Heating & Cooling LLC. We can assist with any number of issues facing your thermostat like broken buttons, it’s not communicating with the system correctly, or there’s no picture on the screen. No matter what the issue is we will always explore other options before deciding it needs to be replaced.